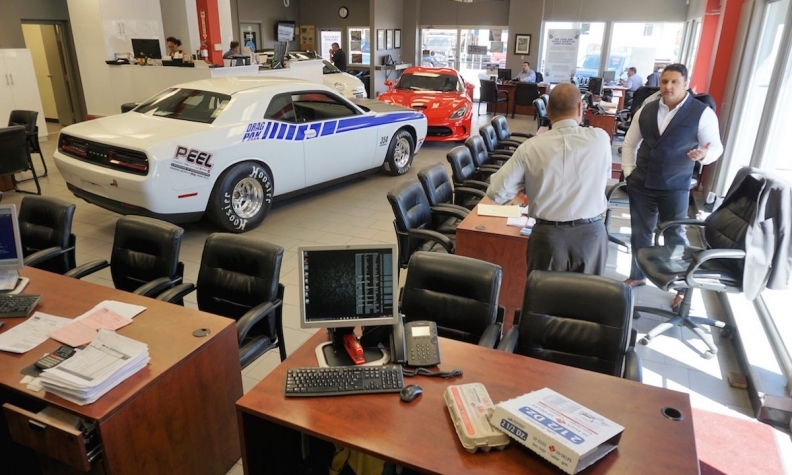 In the era of big-box stores and auto malls, a small Chrysler Fiat dealership in Mississauga, Ont., has combined an old-fashioned small-town footprint with modern on-line and telephone selling to do something miraculous: slay the giants. From an unlikely location, Peel Chrysler Fiat used to be one of the worst-performing FCA dealerships and now claims the Number One spot in Canada. Peel recently managed to squeeze three cars into its two-car showroom — barely — and that was only possible because the third car was a Fiat 500. The entire building, including eight service bays, covers a mere 678 square metres (7,300 square feet). Located in Port Credit, one of the 11 original villages that coalesced to become Mississauga — now Canada’s sixth-largest city — the store sits on a small plot on the road through town, nestled between a bank and a row of townhouses. It doesn’t get much more small town than that. Port Credit’s official population is only about 12,000, and adding to the challenge, the store’s location on the shores of Lake Ontario limits its exposure to the passing public. What’s Peel’s attraction to buyers? Where does the volume come from? Who are the customers? It’s important to note that it wasn’t always this successful. When Diamantakos came on board in 2003, Peel was consistently ranked last for Chrysler retail sales in the Greater Toronto Area. In a good month, it might send five or six new cars over the curb. Now, still operating out of basically the same building, Peel Chrysler Fiat retails more than 2,000 new vehicles a year, which an average of about 165 a month. A used-car lot a couple hundred metres away generates about 700 sales a year. What makes this story even more unusual is that Diamantakos and the president of Peel Chrysler Fiat, father-in-law Ralph Chiodo, closed a much larger store – the former QEW/427 Chrysler in Etobicoke, Ont. – to focus on Port Credit. Chiodo still owns the QEW/427 property; it stores a large part of Peel’s 1,000-new-vehicle inventory and is also the headquarters for Active Green + Ross, which is Chiodo’s tire and auto-Centre chain. 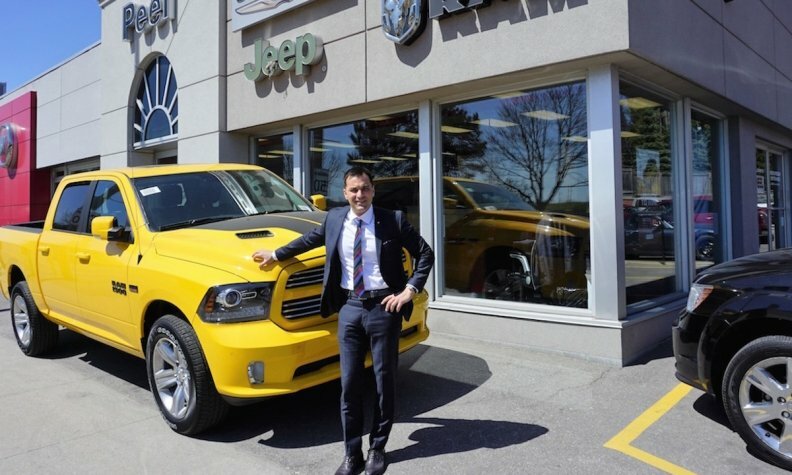 After closing the store that had the largest footprint in Canada, Diamantakos gave his full attention to turning around one of FCA Canada’s smallest-footprint stores. “I had learned the difference between bigger and smaller in the year or two running both. And I thought, we have a unique opportunity. We buy the cars from the manufacturers at the same price [as other dealers], we have a fraction of the overhead, we own the property, why can’t we change the rules of the game and become the small little bargain-basement store? Not sell cars to just people in Port Credit but . . . to buyers from all over the province and the country. To get to 165 cars a month from five, obviously most deals are done on-line or over the phone. Customers go shopping near where they live, get the information they need, “and then they buy the car from us. We save them a bundle.” Delivery anywhere in Canada is offered. Diamantakos credits success to a core group of four staff, some of whom came over from QEW/427: General Sales Manager Gil Legerman; Service Manager Darel Cyr; Office Manager Brenda Shelley and Parts Manager Kevin Murchie. To support sales growth, Peel added nearby satellite properties. A former landscaping business less than a kilometre away now houses a clean-up facility, parts warehouse and five additional service bays. A revamp of the main building five years ago doubled the size of the showroom, brought the storefront facade and signage up to FCA Canada specs and helped win a Fiat franchise. Still, parking routinely spills over onto the city boulevard strip between the roadway and the sidewalk and it’s not easy going. Diamantakos adds that even in the depths of the economic collapse that began in 2008, and the Chrysler bankruptcy, the store did well. And if hard times returned, the business could cut costs on the advertising side and ride out the downturn on its low overhead.